Our school’s journey toward improving formative assessment begun two years ago with our faculty reviewing and discussing a list of Fundamental Instructional Practices (FIP’s). As a group, we chose formative assessment as the practice we felt was the most high-leverage and worth focusing our attention and professional development. Over the course of the next two years, our School Instructional Leadership Team (SILT) made up of 14 teachers and 2 administrators (@MurphyMusings5 and I) began to study, plan, implement, monitor and revise formative assessment definitions, frameworks and planning documents. After our faculty chose formative assessment, we first had to build our common vocabulary on the topic of assessment. At a faculty meeting we compared summative and formative assessments, including definitions, characteristics, examples and non-examples. 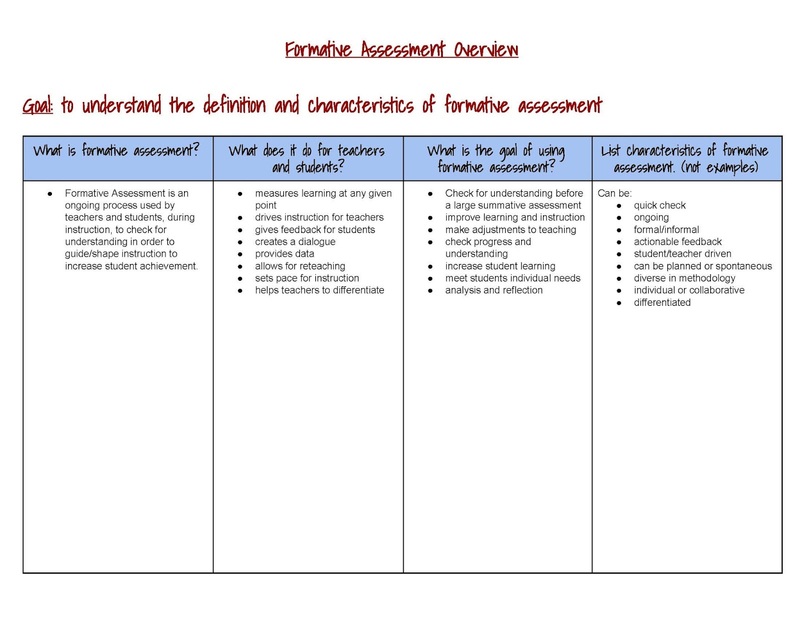 We eventually created a summary document we titled a Formative Assessment Overview. As a group, our common initial understanding of formative assessment was that it was something we did (check for understanding), rather than an ongoing process. Checking for understanding would become just one step in this process. Over the next few months we also began to create a Formative Assessment Framework, including a working Theory of Action. This document is still in revision, but the goal is to create a framework to help guide us in the systematic evaluation of implementation. The framework would not be used to evaluate individual teachers, but instead, as part of the Instructional Rounds process which takes a systemic look at school-wide implementation of a specific practice. After initially creating our formative assessment framework, it became evident to our SILT that although we kept referring to formative assessment as a “process”, we actually lacked the identification or formalization of this process. So now we needed a process. However, instead of attempting to develop this from scratch, we began reviewing books and literature on the topic and we found exactly what we were looking for in the book “The Formative Assessment Action Plan” by Nancy Frey and Doug Fisher. 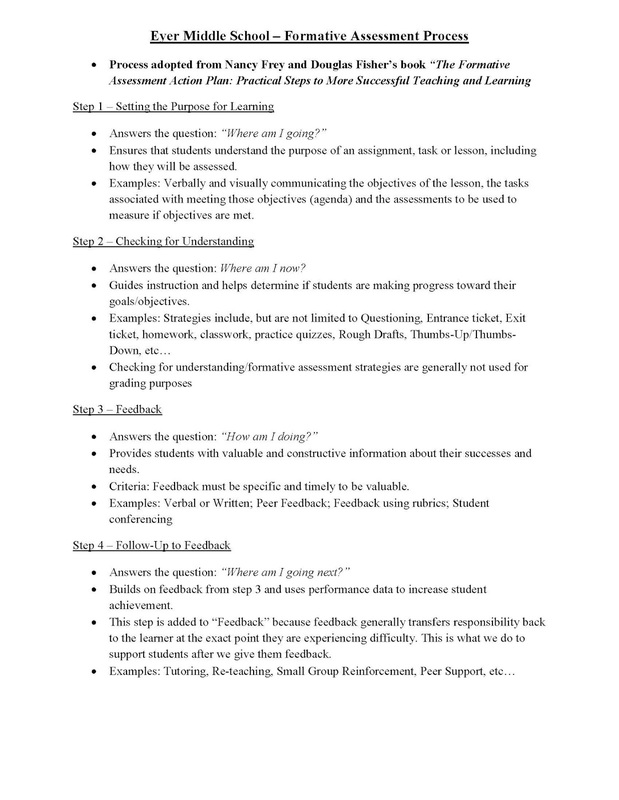 In their book, Frey and Fisher outline a practical four-step process for formative assessment. We immediately ordered copies of their book for our entire SILT and began our work to adapt their process to make it our own. We tweaked the names of the steps a bit, but ultimately stuck with the process. 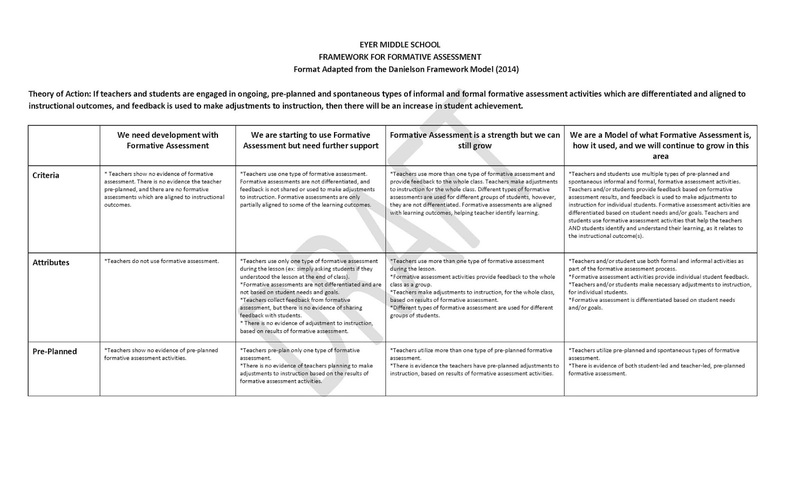 In addition, we worked with our faculty to create and revise a practical planning document that could be used to assist in their thought and planning process when designing formative assessment. The process to create these documents and develop our understanding of formative assessments involved monthly meetings with our SILT, as well as the devotion of faculty meeting and professional development time. Many of these meetings were led by teachers who were part of our SILT. This was work we believed in and our teacher-leaders invested a lot of time and effort to ensure the high quality results that could be transferred into the classroom. After implementing the formative assessment process into classrooms throughout our building, through observations it became apparent that we could not accomplish steps 2-4 to a high degree of quality before we first were able to appropriately set the purpose for learning. Our course curricula lacked clear, specific, student-friendly learning objectives. If we were going to engage students in the formative assessment process, they first had to be able to understand the learning objectives. After modeling and sharing examples of student-friendly learning objectives, including the use of “I Can” statements, we allocated numerous hours of time during faculty meetings and professional development for teachers to write objectives for their courses. This involved reviewing curriculum, pacing guides, unit and lesson plans. Teachers worked together to create “I Can” statements for each unit in their curriculum and began to communicate them to students on a daily basis in their classrooms. 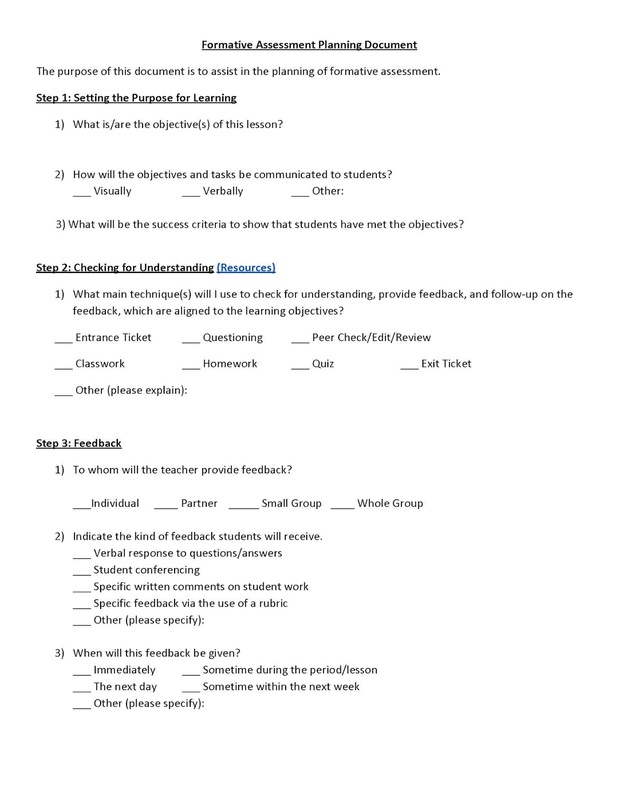 As teachers began to implement the use of student-friendly learning objectives into their classrooms, building administrators modeled steps 3 and 4 of our formative assessment process by giving ongoing, specific feedback to individual teachers so they could continue to improve their practice. Our next steps as a school include revising our Formative Assessment Framework to better reflect the four-step process we developed. In addition, our faculty survey feedback and observational data show that we need to spend professional learning time on methods and strategies related to Step 3: Feedback and Step 4: Follow-Up. During this two-year journey we have learned so much TOGETHER. I think this is the best outcome from this process and journey. A group of teachers (SILT) took a leadership role in improving instruction, engaged the faculty, and devoted an appropriate amount of time for the work. During this time, our school did not focus solely on formative assessment, but also on Questioning, Grading Practices and other topics. However, our formative assessment work is where we really invested ourselves and has helped us create a culture focused on improving instruction. How does your school create a culture that focuses on improving instruction? At our school, we believe that Positive Attitudes Will Succeed. 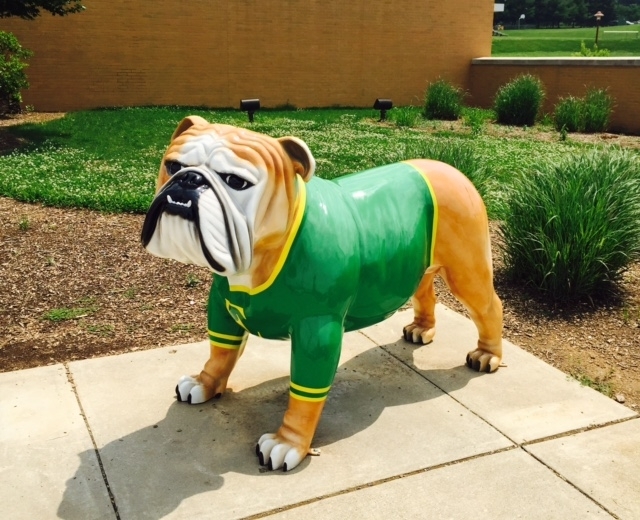 Our middle school’s mascot is the bulldog and the “PAWS” (Positive Attitudes Will Succeed) acronym fits right into our school culture. As part of our program, students are recognized for their effort and behavior, such as being prepared for class, or exhibiting positive character traits, by receiving feedback and a “PAWS Sticker” which they place on a specific page in their agenda books. Teachers, bus drivers, cafeteria aides, office staff and administrators all have stickers they give, along with feedback, to students who exhibit positive behaviors or character traits. As an incentive, each student needs a minimum number of stickers, decided by each team of teachers, to participate in sports and activities at the end of the day during our reward period, called Dog Pound. In addition, at five points in the year we do a PAWS sticker count and 100 or more of our top earners can participate in a Tailgate, Pancake Breakfast (they can also bring a friend to this one), Bowling Party, Ice Cream Party or Pool Party. The key to our program is that we provide opportunities for all students to be recognized for their efforts. We have students from our multiple disabilities, emotional support, autistic support and all other classrooms in the school, participate in our PAWS activities. It is not always the same students, or the typical “Straight A” student, who are being recognized or rewarded. We focus on ensuring our program is inclusive of all students. We have a PAWS committee, comprised of students, parents, teachers, staff and administrators, which meet monthly to plan PAWS events and make adjustments to our program. The positive feedback we receive from both students and parents is overwhelming. Lately, I have read a lot of push back against positive reward systems in schools. There have been numerous posts about internal student motivation and whether it does, or should, drive them to succeed. I have heard multiple comments made about reward systems being detrimental to students, and I’ll be honest, I don’t get it. I think rewards are getting a bad name lately. Whether it be gamification points in the classroom, professional development badging systems, Favorites, Likes or Retweets, a promotion, a raise, positive feedback from a supervisor, or a compliment from your spouse, people receive positive “rewards” in many ways which they appreciate and enjoy. Ultimately, it’s not the reward that is our motivator, but these rewards should not be painted as a bad thing, or detrimental to people. These things are good! I question when people write or speak about how they should not matter and are damaging to students. I am sure there are programs that are not ideal, but I see our, and many other, positive behavior programs working well everyday. Internal motivation is something we want to foster in our students as they learn and grow. However, I also understand the needs of middle school students. The goal of our school’s positive behavior program is not solely to motivate students to behave in order to gain a reward, but to give opportunities for adults to provide specific feedback to students about successful character traits and behaviors. The motivation for student actions comes from many places, such as the relationship between the teachers and the students, parental influences, peers, or even internal drive. The reward is feedback and recognition of the positive efforts or behaviors students are exhibiting and I do not think it is a bad thing. In fact, I see the positive impact it has on our students on an everyday basis. What are your thoughts about positive behavior programs?